Background: Dual-task procedures are commonly implemented to examine cognitive load and listening effort as individual differences in cognition often determine successful listening. However, which methods are most efficacious is unclear. Specifically, standardized, targeted assessment procedures for establishing cognitive function, and age-related changes that might account for changes in dual-task performance have yet to be established. Additional data are needed across aging populations, including middle-aged adults and older adults to establish the trend of performance changes throughout the aging process. Investigations of the relationship between cognitive function and dual-task performance may better inform clinical decisions. Objective: The purpose of this study was to investigate if cognitive function predicts dual-task performance across adults with and without hearing loss. Methods: Participants were divided into two groups based on age. 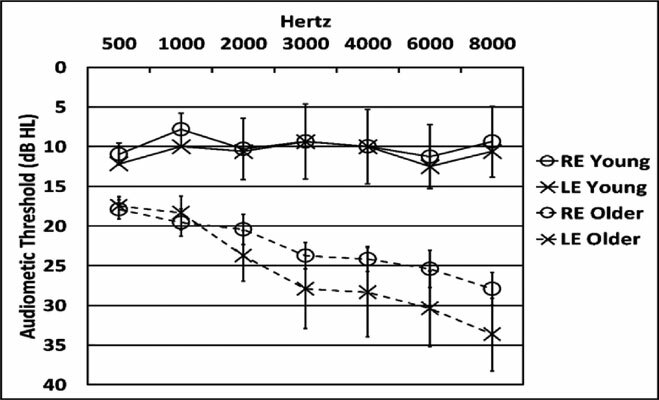 Group 1: 14 listeners (Female = 11), 30-50 years old, with normal hearing. Group 2: 12 listeners (Female = 9), 60-80 years old, with normal hearing to near-normal hearing, including typical age-related hearing loss. Participants were administered four of the Woodcock-Johnson III cognitive subtests and standard hearing threshold procedures. All participants were tested in each of three experimental conditions, including two perceptual-cognitive dual-tasks: (1) Auditory word recognition + visual processing, (2) Auditory working memory (sentence) + visual processing in noise, and (3) Auditory working memory (word) + visual processing. Results: Results indicated that cognitive function does predict dual-task performance regardless of age and hearing function. Conclusion: Cognitive function may predict dual-task performance during speech-in-noise tasks. Further research investigating the predictive value of related cognitive subtests to listening effort is warranted. Cognitive function, cognitive spare capacity, aging, dual-task, noise, hearing loss.